BuckyBalls Magnetic Building Spheres are really that cool. You can build basic shapes, complex sculptures, magnetic jewelry, or even outfit your refrigerator in bold and unique ways. Just look at all the shapes and forms you can make with these bad boys - it's amazing! BuckyBalls Magnetic Building Spheres are just what you need to help you brave the boredom of the office. And really, when else will you get to play with your BuckyBalls at work and not get in trouble? 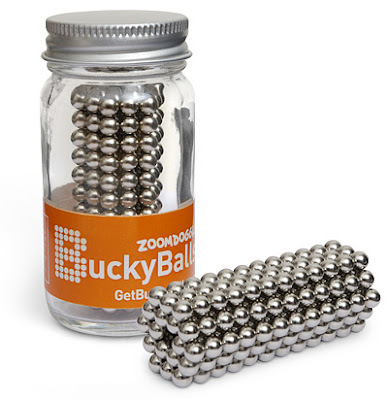 Super powerful, rare earth, magnetic balls - for you to play with. Each set contains 216 BuckyBalls. Ages: Not for kids or adults under 12 years of age. Dimensions: each Buckyball is approx. 0.125" in diameter.